Jackie Clark’s poetics is a poetics of spying on the prismatic philosophical underpinnings of fate. We live and love in her hopes and surrenders. Few poets have the ability to record the gossamer strands of their own cognitions as Jackie Clark does. The poems in Aphoria are miraculous in the way they map a topology of quotidian thought in unassuming yet radiant language. 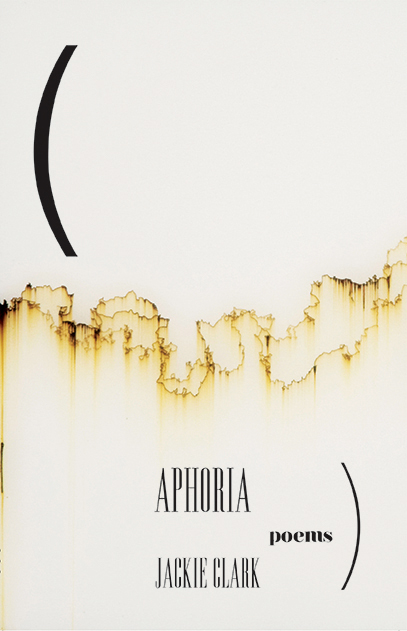 Aphoria is something like a blueprint for the invisible architecture of the human soul. Not so much the soul that belongs to Jackie Clark, but the one that belongs to and connects all of us. Jackie Clark is the author of Aphoria (Brooklyn Arts Press) and the chapbooks Office Work (Greying Ghost), I Live Here Now (Lame House Press), Sympathetic Nervous System (Bloof Books), and most recently Depression Parts (dancing girl press). Her writing has appeared or is forthcoming in Fence, The Brooklyn Rail, The Tiny, and the anthology Ritual and Capital co-published by Wendy’s Subway and Bard Graduate Center. She works at Eugene Lang College for Liberal Arts at The New School and teaches writing in New Jersey. She can be found online at nohelpforthat.com. open to dynasty and decline. Even the cavern of wonder is without wonder.